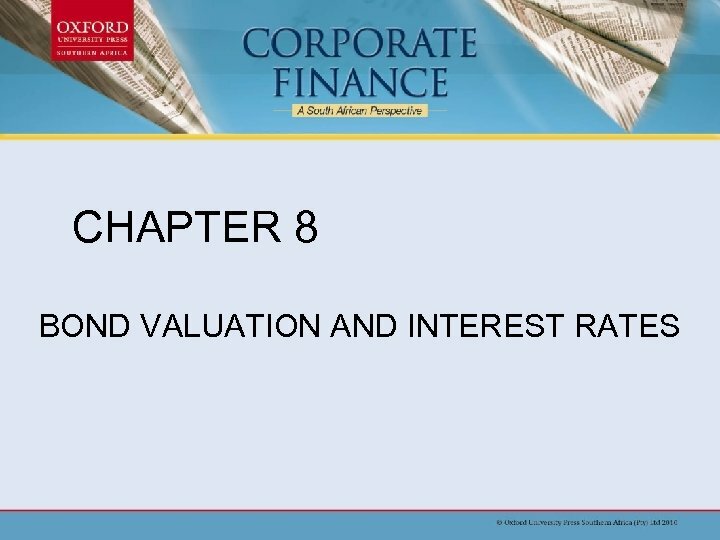 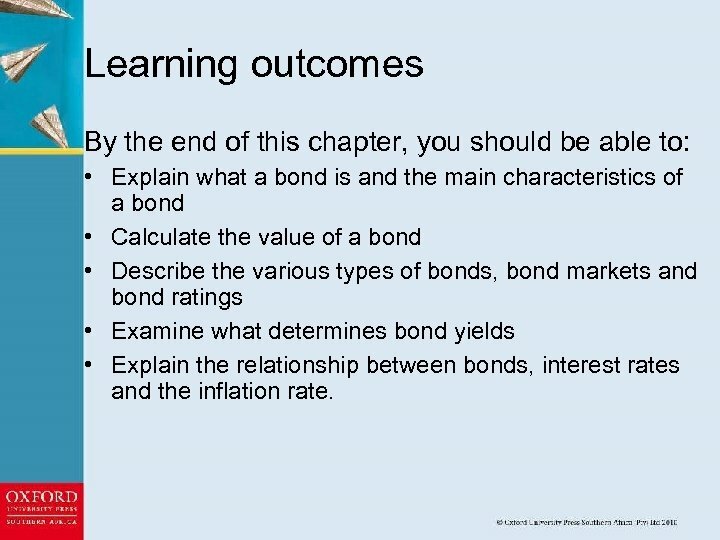 Learning outcomes By the end of this chapter, you should be able to: • Explain what a bond is and the main characteristics of a bond • Calculate the value of a bond • Describe the various types of bonds, bond markets and bond ratings • Examine what determines bond yields • Explain the relationship between bonds, interest rates and the inflation rate. 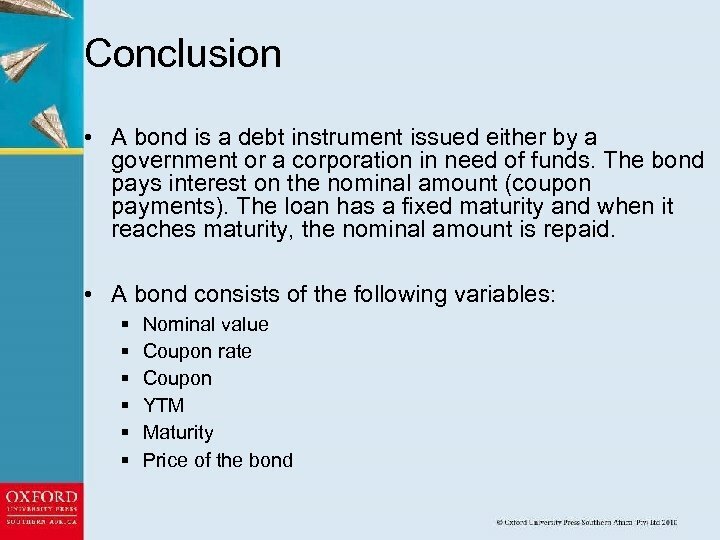 Conclusion (cont. ) 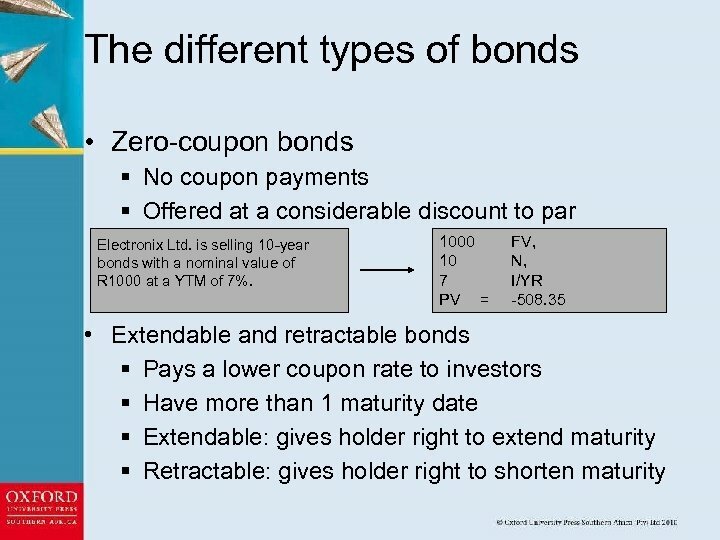 • When the YTM (the interest rate in the market) and the coupon rate differ, the price of the bond will also differ from the nominal value of the bond. 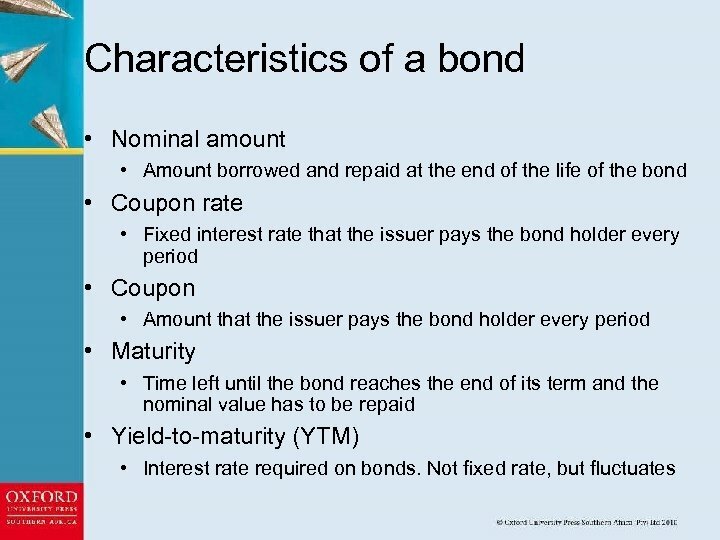 When the interest rate in the market goes up, the price of the bond goes down to compensate the investor for earning a lower coupon rate (trading at a discount). 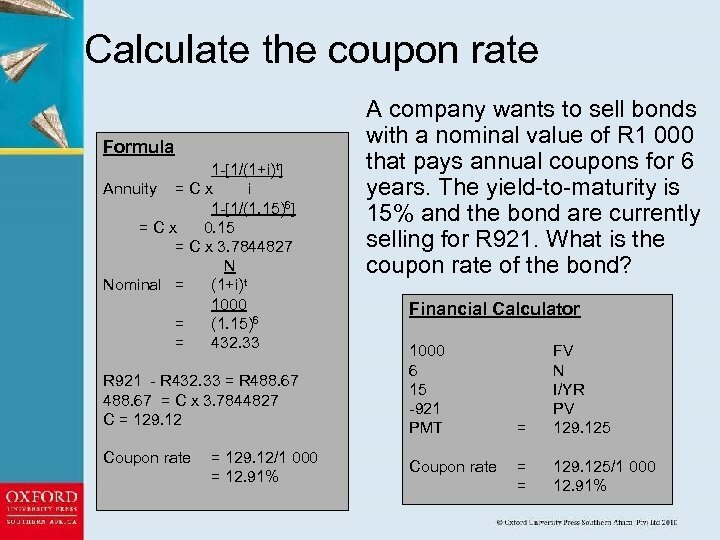 • When the YTM is lower then the coupon rate, the price of the bond will increase relative to the nominal value. 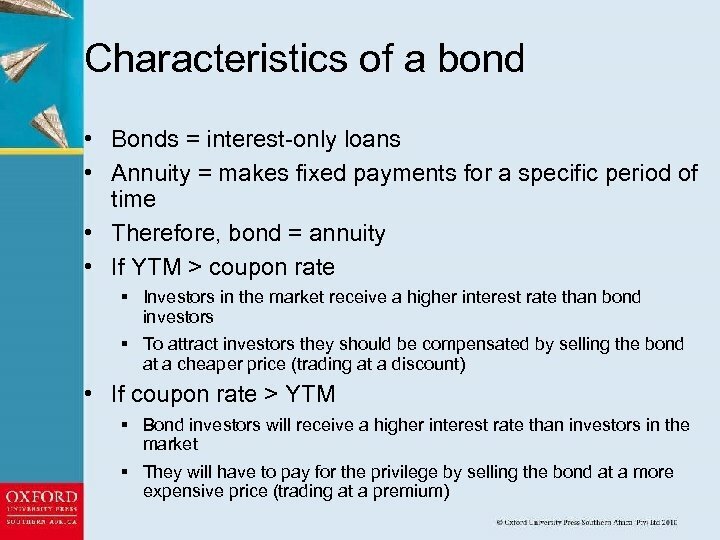 The price of the bond will be more because the bond will pay a higher coupon rate than in the market and, therefore, the investor has to pay more for that privilege. 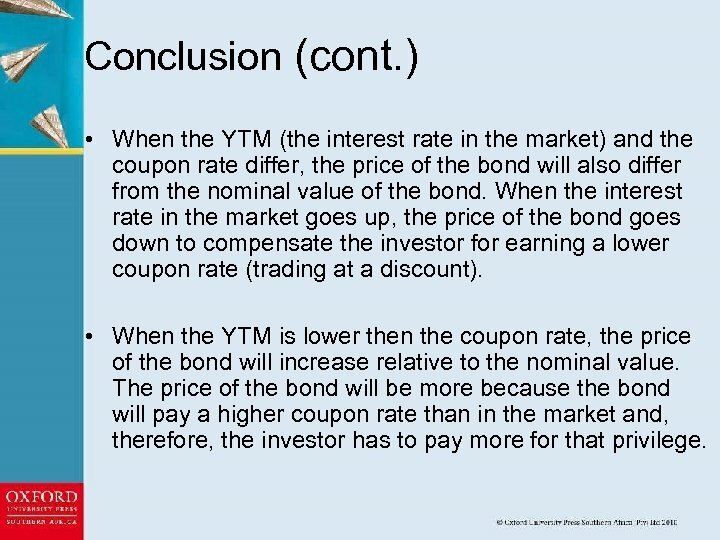 Conclusion (cont. ) 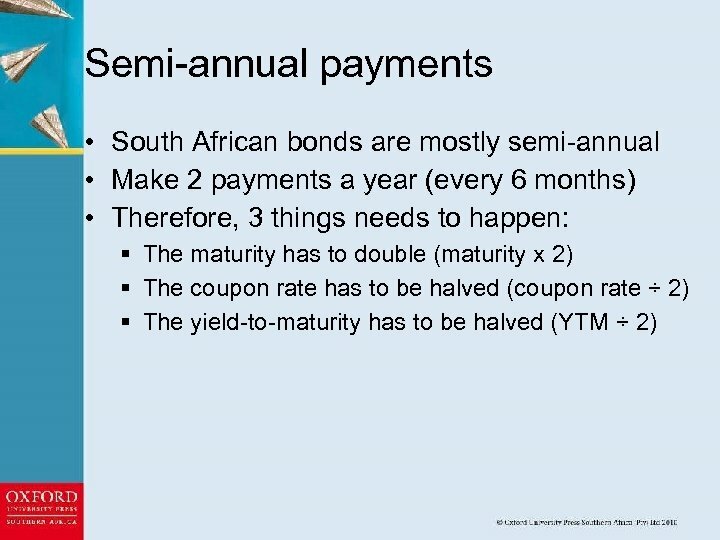 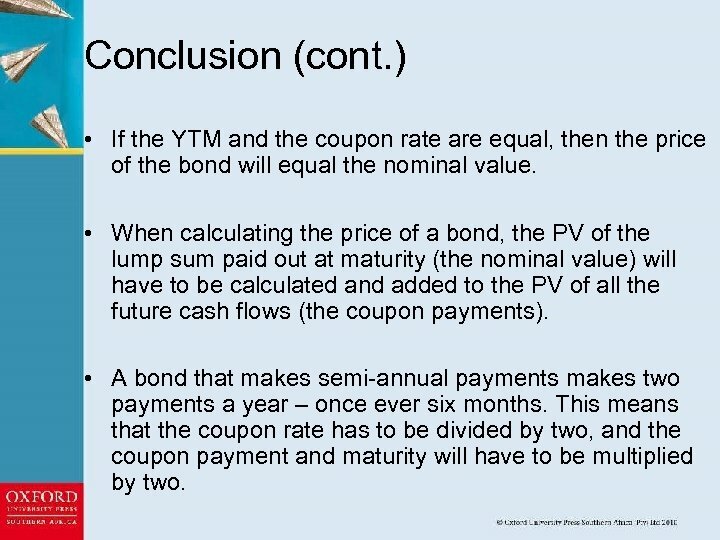 • If the YTM and the coupon rate are equal, then the price of the bond will equal the nominal value. 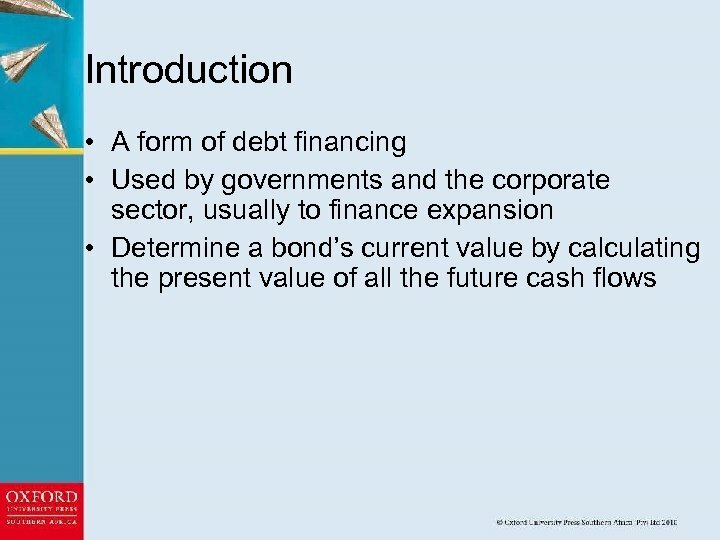 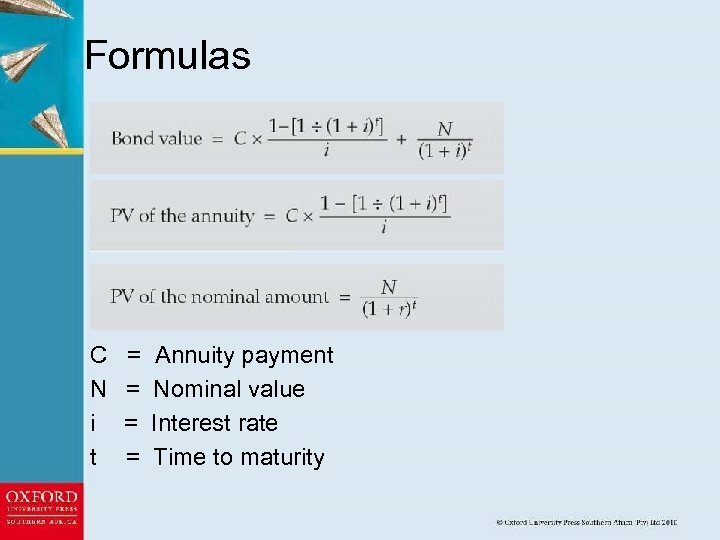 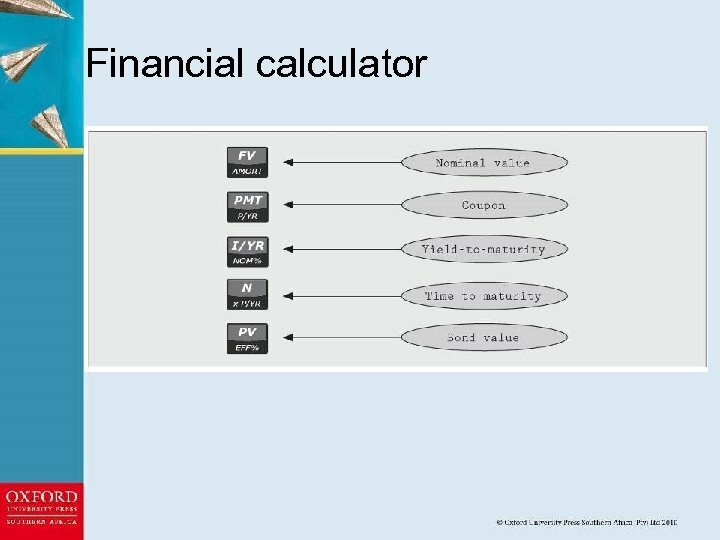 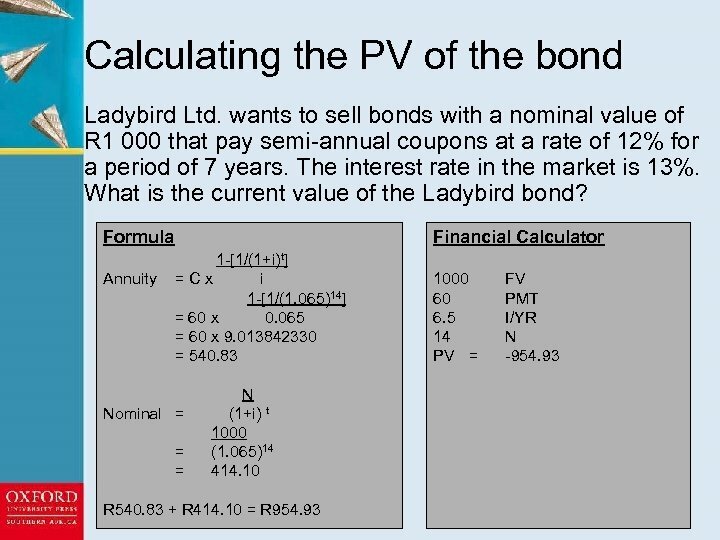 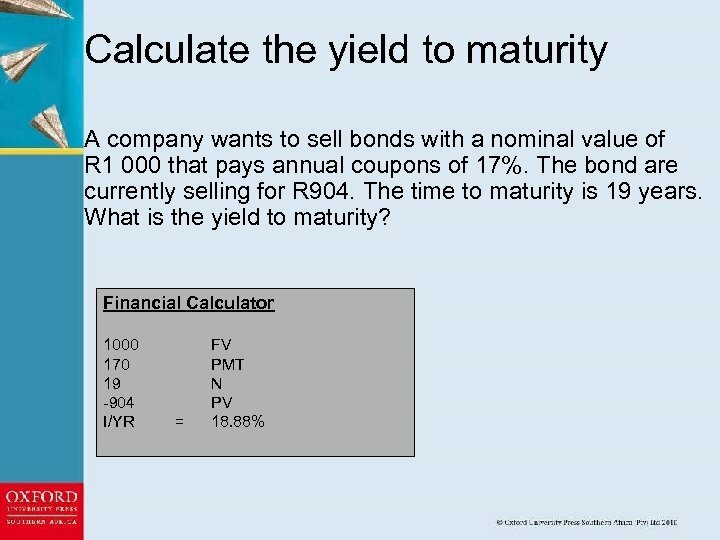 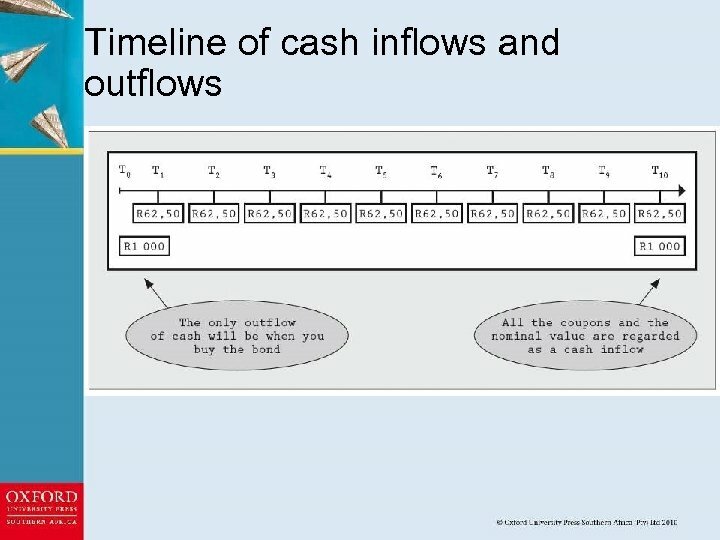 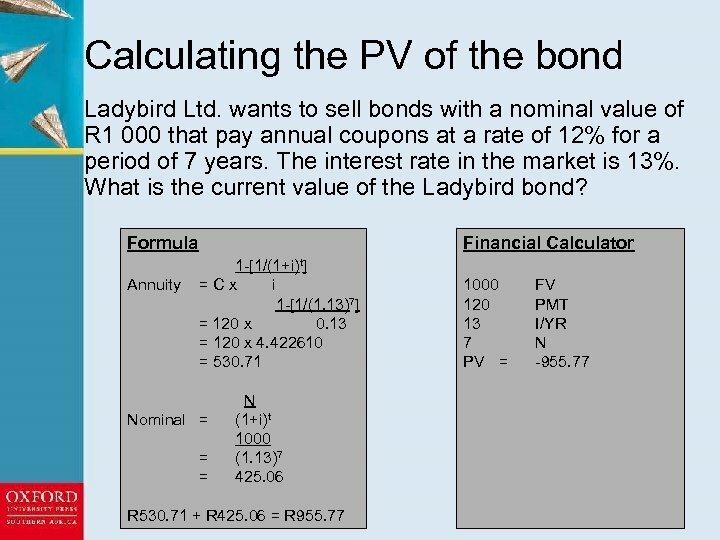 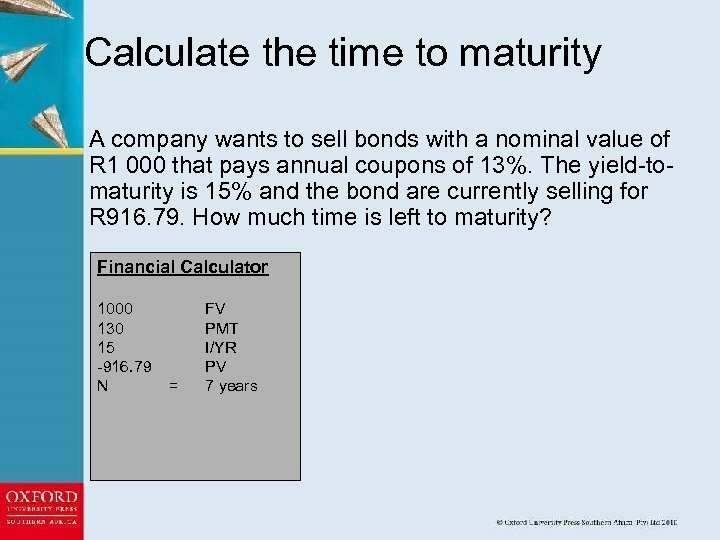 • When calculating the price of a bond, the PV of the lump sum paid out at maturity (the nominal value) will have to be calculated and added to the PV of all the future cash flows (the coupon payments). 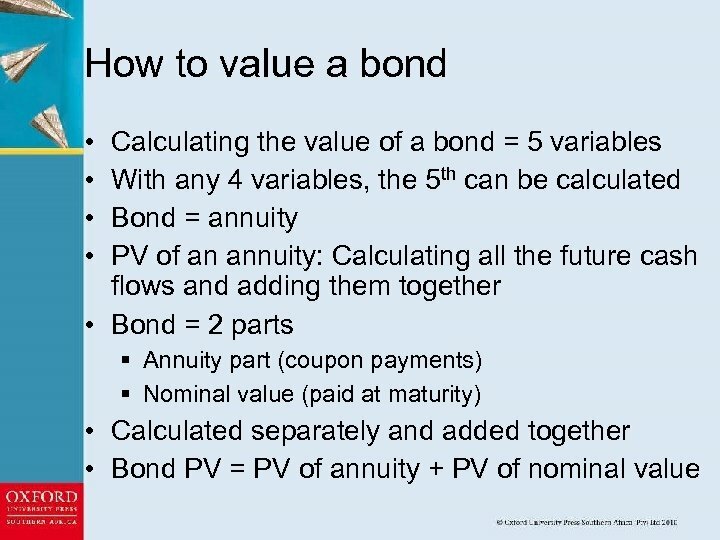 • A bond that makes semi-annual payments makes two payments a year – once ever six months. 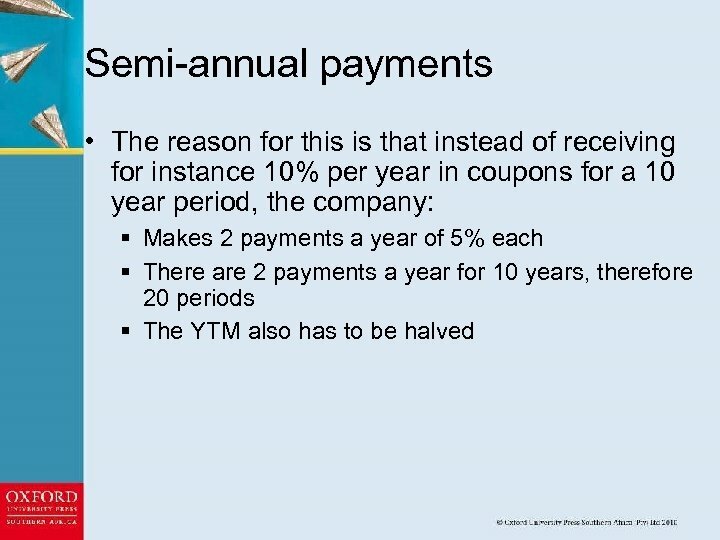 This means that the coupon rate has to be divided by two, and the coupon payment and maturity will have to be multiplied by two. 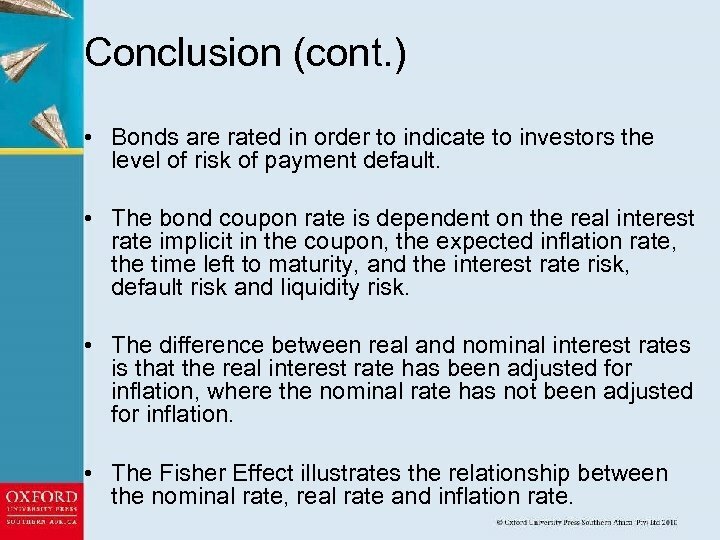 Conclusion (cont. ) 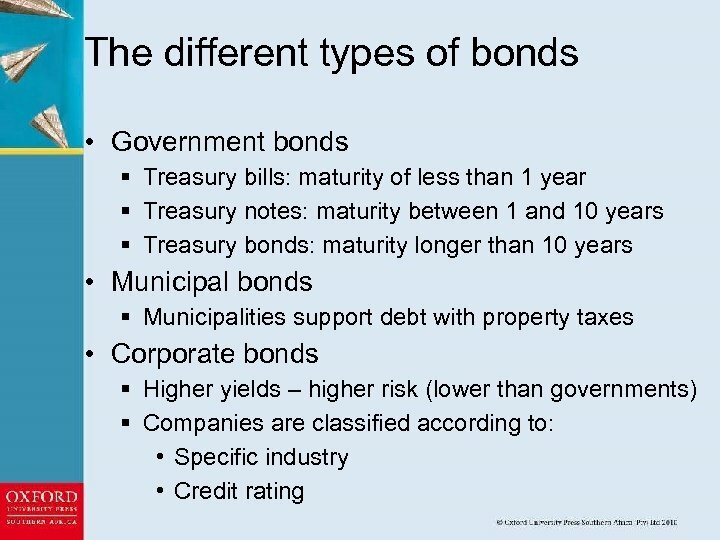 • There are various types of bonds, namely government, municipal, corporate, convertible, zero-coupon, extendable, retractable, foreign currency, junk and inflation-linked bonds. 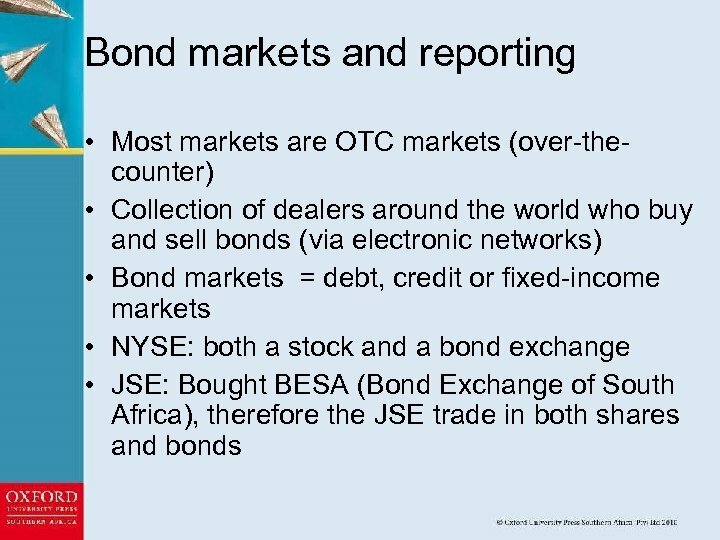 • The New York Stock Exchange is the biggest bond exchange in the world; South Africa’s BESA is a leader in emerging economies. 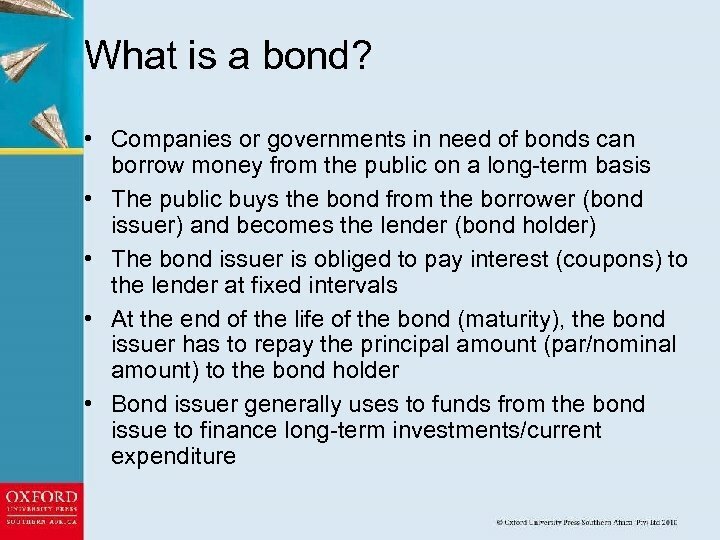 Mostly, the bond market is an OTC market. 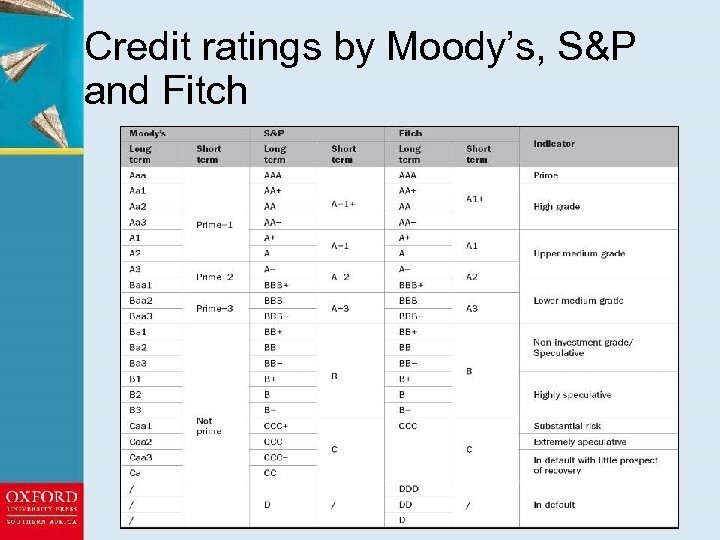 • Moody’s, Standard & Poor’s and Fitch are three main credit-rating agencies. 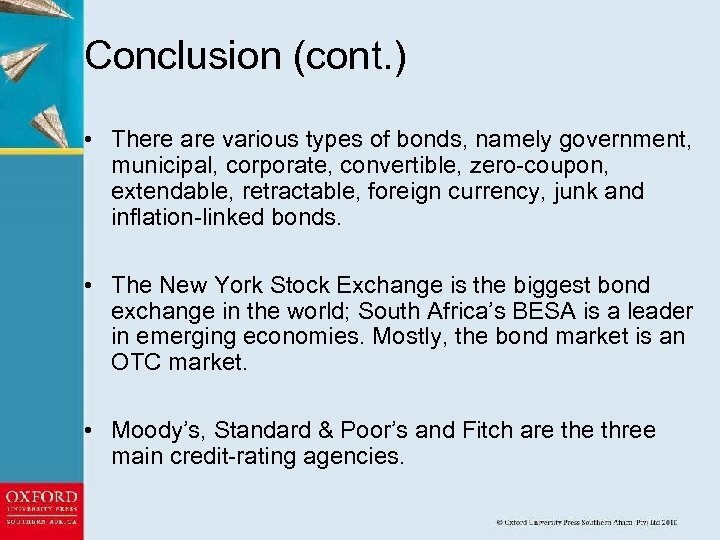 Conclusion (cont. ) 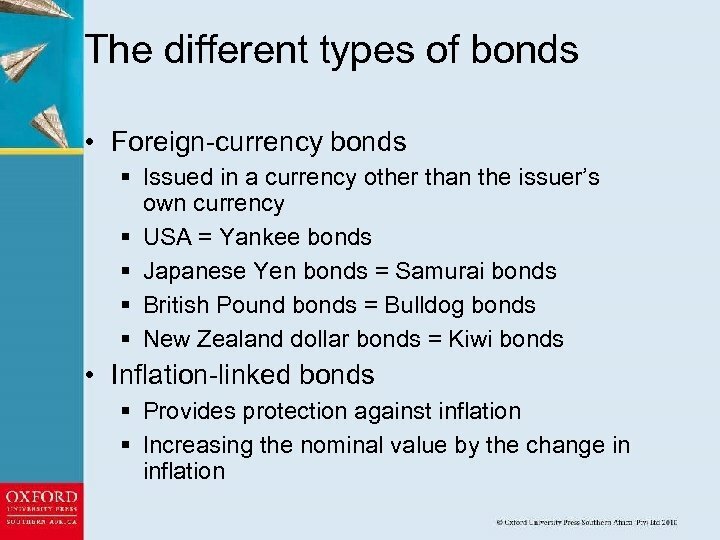 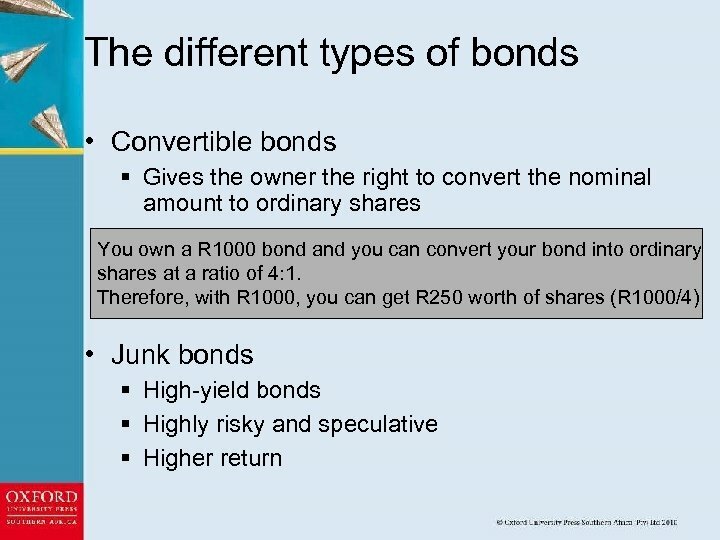 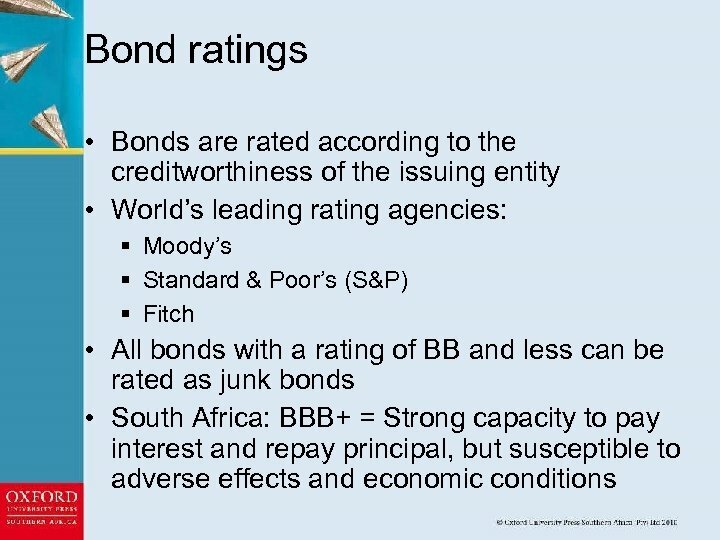 • Bonds are rated in order to indicate to investors the level of risk of payment default. 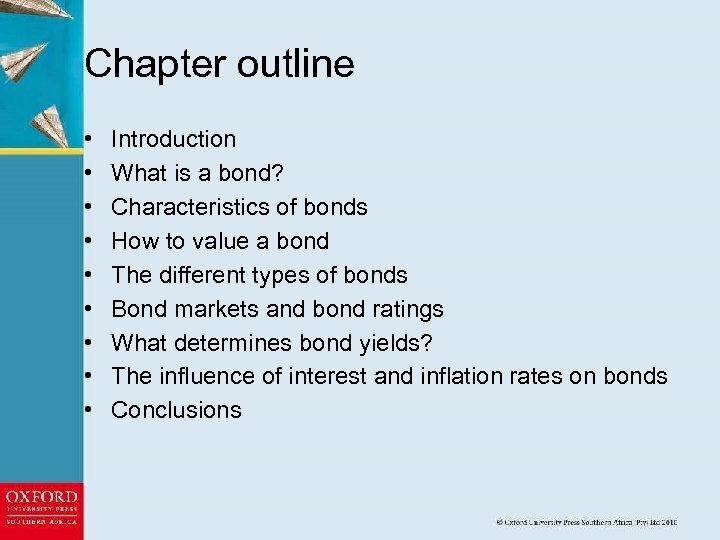 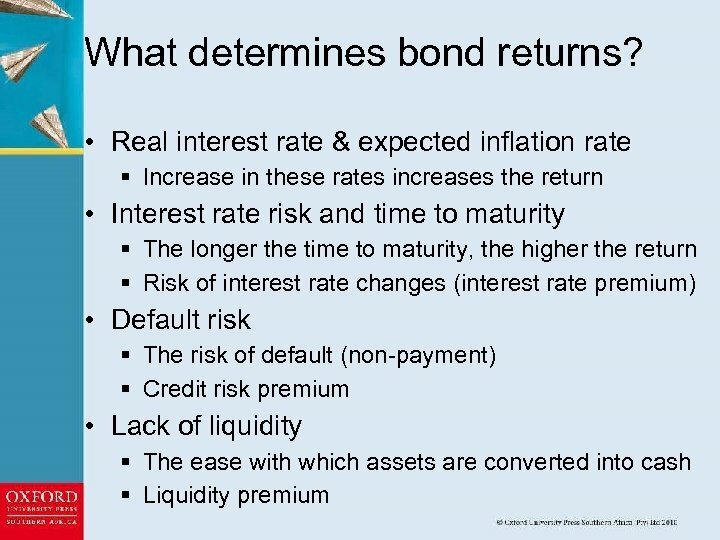 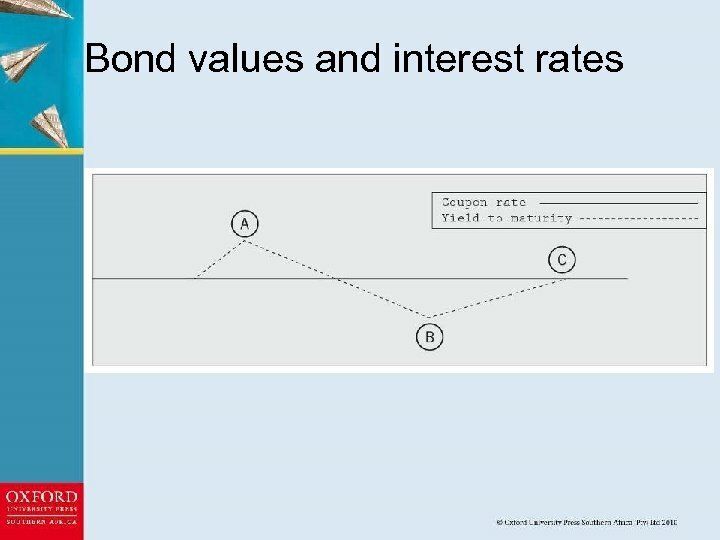 • The bond coupon rate is dependent on the real interest rate implicit in the coupon, the expected inflation rate, the time left to maturity, and the interest rate risk, default risk and liquidity risk. 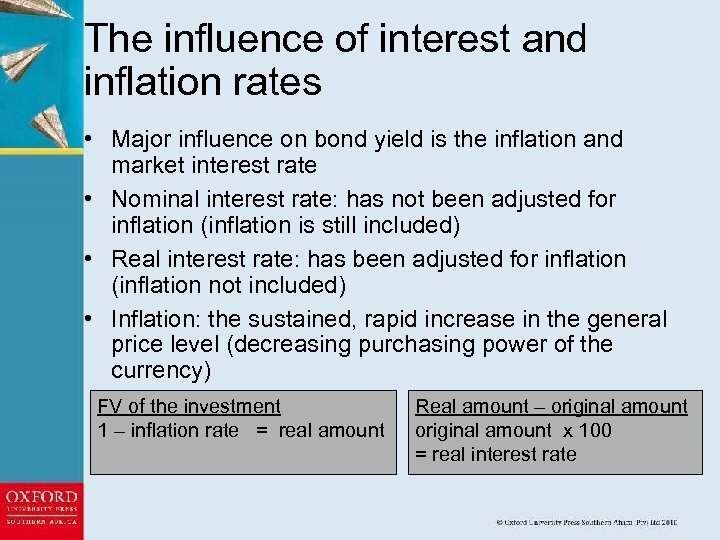 • The difference between real and nominal interest rates is that the real interest rate has been adjusted for inflation, where the nominal rate has not been adjusted for inflation. 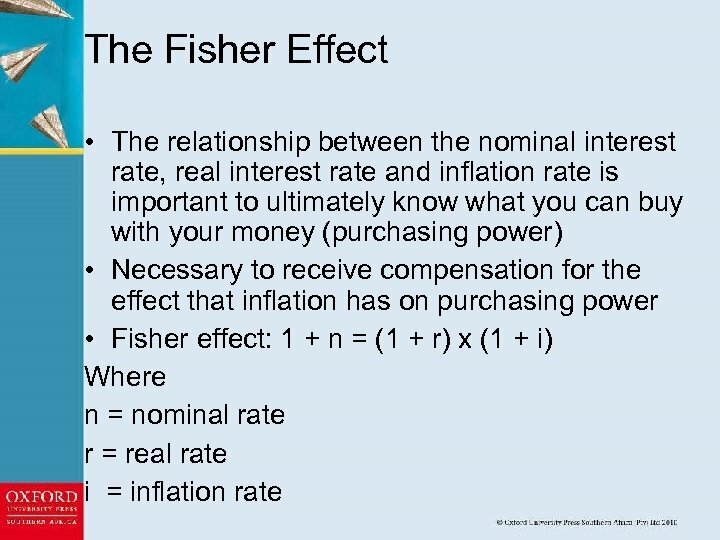 • The Fisher Effect illustrates the relationship between the nominal rate, real rate and inflation rate.